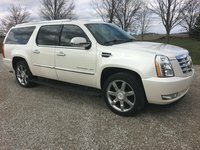 Looking for a Used Yukon XL in your area? CarGurus has 13,260 nationwide Yukon XL listings starting at $1,995. 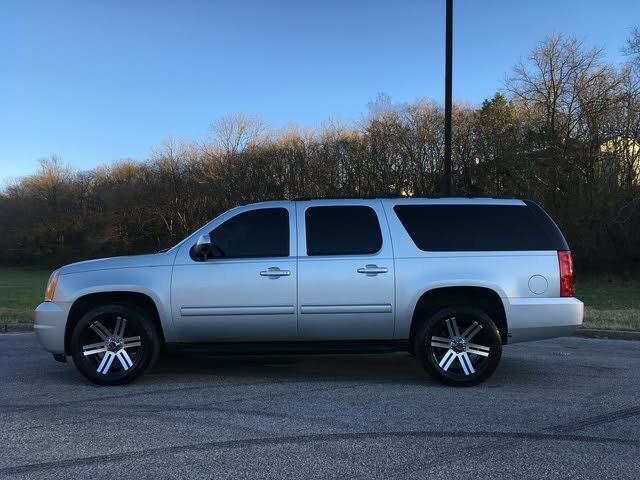 Pretty fair road manners, a handsome profile, plenty of V8 acceleration and towing capability, class-topping interior room with loads of cargo space and a welcoming, class-laden cabin give the 2012 GMC Yukon XL some shine. Third-row seats that have to be removed to take advantage of maximum cargo-carrying abilities, some less-than spectacular mileage numbers and the 2012 Yukon XL's’s long braking distances, as well as the unrefined noise the Denali’s sizable V8 emits on acceleration, dull this vehicle's shine a little. When you absolutely, positively have to get the biggest sport ute out there, the 2012 GMC Yukon XL is a pretty good choice. Major towing capacities, available 4-wheel-drive and all-wheel-drive configurations, loads of standard features and plenty of cargo space are the hallmarks of this brute, along with the feeling of confidence in driving one of the larger vehicles on the road. If, however, passenger toting and fuel efficiency are uppermost in your mind, a large crossover might be the wiser choice. Should the need arise for a truck-based full-size SUV, choices are dwindling quickly. There remains, however, GMC’s 2012 Yukon XL (extra long) lineup to consider. This behemoth will seat up to 9 passengers, and even the base trim comes with a slew of standard features. A choice of three V8 engines, an option of 4-wheel drive (4WD) or all-wheel-drive (AWD) traction, 3 rows of seating and some serious towing capabilities are also either standard or available, as is, alas, a pretty hefty price tag. In any case, this stretched-out Yukon can be delivered in three trims, the entry-level SLE, the midlevel SLT and the flagship Denali. The two lesser trims, meantime, are subdivided into the half-ton 1500 variation or the three-quarter-ton 2500 designation. All trims offer 137.4 cubic feet of cargo space with the second-row seatbacks folded and the third-row seats removed. Unfortunately, hoisting this standard rearmost bench seat in and out is not a chore for the faint of heart, as it remains heavy and bulky, but a fairly cavernous 49 cubic feet of toting space is available if the third row is left in place. As the XL designation implies, all trims of this outsized Yukon come stretched to 222.4 inches (18 feet, 6.4 inches) on a 130-inch (10 feet, 10 inches) wheelbase. This is compared to the 202 inches of overall length and 116-inch wheelbase common to the standard Yukon. Of course these added inches provide more cabin room, at least for first- and second-row occupants, but that pesky third row remains knee-challenging, according to most reviews. Meanwhile, the SLT again sports a transmission that’s geared for added towing muscle, while this year it gets an upgrade to the navigation suite that’s optional for the two lower XL trims and standard in the Denali. The rear-seat DVD entertainment system available to all trims also gets a few tweaks. Reviewers are in agreement that if you’re looking for more people-hauling capability than the compact sports coupe may offer, a large crossover, like Jimmy’s own Acadia, might be a wiser choice. If it’s toting and towing power that you’re after, however, some alternatives to the Yukon XL include Ford’s less capacious and less potent Expedition EL, which does boast an easy-fold third-row seat, or Toyota’s powerful but also less spacious Sequoia. Of course for a tad less money Chevy’s Suburban is an excellent alternative to the Jimmy, while for a whole lot more money, Cadillac offers its super-posh Escalade sport ute. 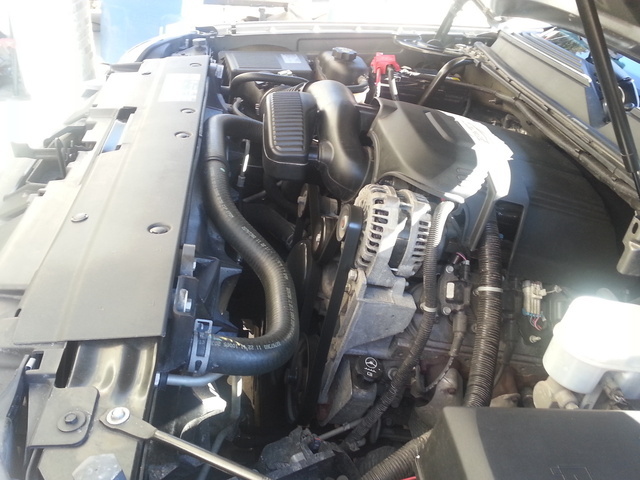 The 3 engine offerings for the 2012 Yukon XL lineup begin with the variable-valve-timed (VVT), ethanol-capable Flex Fuel (FFV) 5.3-liter V8 that comes standard in the SLE 1500 and the SLT 1500. Mated with a standard 6-speed shiftable automatic transmission, this nifty V8 puts out 320 hp at 5,400 rpm and 335 lb-ft of torque at 4,000 rpm. All those ponies will tow up to 8,100 pounds of trailer using the standard hitch and wiring, while mileage is a so-so 15 mpg city/21 highway in either the standard rear-wheel-drive (RWD) editions or the available 4WD configurations. Powering the 2500 trim level is a 6.0-liter V8 engine, again boasting VVT and Flex Fuel capabilities. The delivered 6-speed shiftable automatic transmission in this muscle-laden trim allows 352 hp at 5,400 rpm and 382 lb-ft of torque at 4,200 rpm. Some tweaks to the gearbox give this hefty hauler 9,600 pounds of towing capacity with the heavy-duty trailer hitch and wiring, not to mention the standard 3.42 rear axle ratio, but mileage drops to a woeful 10/16 in RWD editions and 10/15 in the 4WD variant. As befits its top-shelf status, the Yukon XL Denali boasts a standard 6.2-liter FFV, VVT V8 powerplant that again mates with the 6-speed shiftable automatic for 403 hp at 5,700 rpm and 417 lb-ft of torque at 4,300 rpm. Towing capacity for this high-end trim drops to 7,900 pounds in the RWD edition, with mileage running 14/18. The AWD-equipped version, meantime, will tow up to 7,800 pounds while burning gas at the rate of 13/18. The SLE and SLT can be delivered with an available part-time 4WD system boasting a 2-speed transfer case, a heavy-duty locking rear differential and auto-locking hubs. Meantime, the not-so-ready-for-rock-climbing Denali can be delivered with an optional AWD configuration that allows this sizable ute to cruise in RWD over dry roads while standing ready to instantly transfer torque from the wheels that slip to the wheels that grip when the snow flies. Testing showed a Chevy Suburban, equipped with the identical 5.3-liter V8 found in the Yukon XL 1500 level, scooting from 0-60 in a respectable 9 seconds flat. Reviewers, therefore, note that all three V8 powerplants accelerate nicely and have plenty of trailer-towing muscle, even up long grades. Of course, reviewers also caution that these V8s do not exactly sip gas. A few reviewers also opine that the Denali’s larger V8 feels only slightly stronger than the base 5.3-liter V8, while others claim to be impressed with the larger eight’s ability to accelerate such a hefty vehicle so quickly. Reviewers do, however, agree that the 6-speed shiftable automatic is smooth and responsive in either auto or manual mode, while the two smaller engines sound well refined, even on hard acceleration. Finally, a number of reviewers are not so impressed with the maturity of the Denali’s 6.2-liter V8, claiming it grates on the ears during acceleration and that the racket doesn’t completely go away even at cruising speeds. Again for 2012, each Yukon XL comes with a front independent suspension sporting a short and long arm front end and a solid live axle rear setup, with stabilizer bars fore and aft. The 1500 trims roll on 17-inch alloy wheels mounting all-season tires, with 2500 trims boasting those 17-inch wheels with all-terrain rubber. The Denali, meantime, flaunts 20-inch chrome alloy wheels mounting all-season tires. Most reviewers praise this heavy ute’s touring-oriented ride comfort, though a few claim that the Denali exhibits a bit less aplomb over rough roads due to the short sidewalls of its 20-inch tires. A number of reviews also find that the load-leveling Autoride Active Suspension System that’s optional in SLT trims and standard with the Denali does little to improve this oversized Yukon’s comparatively competent bump-handling capabilities. Steering is noted by most reviewers, meanwhile, to be well-suited to downtown traffic, but a bit too light for carefree highway cruising. Many reviews compliment the Yukon XL’s well-damped body lean and lack of noseplow in tight corners, but all lament a certain ponderousness inherent in this brutish ute’s super-sized dimensions. Additionally, reviewers caution that the added length won’t help in maneuvering crowded parking lots. Brakes, finally, are described as powerful and true by reviewers, though tests found this weighty titan taking an uncomfortably long 145 feet to come to a stop from 60 mph. Only a step below Cadillac in the General Motors hierarchy, GMC offers a few extras in its heavyweight SUV offerings. Jimmy’s entry-level Yukon XL SLE trim, for instance, flaunts a standard roof rack, step running boards and heated power-adjustable mirrors outside, with premium cloth upholstery, 6-way power-adjustable front bucket seats, second-row split-folding bench seats and full power accessories adorning the interior. The well-wrought cabin also sports leather, simulated wood and simulated alloy dash, door and steering wheel accents, along with Sun-Sensor-monitored tri-zone auto climate control. Convenience items, meantime, include cruise control, an auto-dimming rear-view mirror and tilt-wheel steering, while OnStar Directions and Connections technology plays well with Bluetooth hands-free communications. Entertainment in the base SLE is offered via a single-CD player that boasts 9 Bose premium speakers, satellite radio and a USB port, while an optional front bench seat increases this big base ute’s passenger capacity from 8 to 9 somewhat cramped folks. Meanwhile, the midlevel SLT adds leather upholstery and power-adjustable pedals, as well as rear parking sensors and remote engine start, both of which are optional in the SLE. A universal remote garage door opener and a rear-view camera also come with this notched-up trim, while available captain’s chairs can be inserted into the second row to replace the bench seating, with passenger capacity reduced to 7 people. The 2500 trim level in both the SLE and SLT variations, meantime, sports standard all-terrain tires. The flagship Denali, as befits its princely stature, throws an auxiliary transmission cooler, power rear liftgate, premium leather upholstery, 8-way power-adjustable front seats and heated second-row captain’s chairs on top of the more plebian offerings in lesser trims. This top-shelf trim also boasts extras like a standard heated steering wheel and upgraded cabin accents, including a leather and genuine wood steering wheel, as well as memory for driver's settings, 10 Bose speakers, NavTraffic radio and a newly upgraded hard-drive-based navigation suite that, along with the audio system, interfaces with an 8-inch dashboard-mounted display. The standard captain’s chair second-row seats in the trim-topping Denali, meanwhile, can be deleted in favor of available bench seats, thus increasing passenger capacity from the standard 7 to 8. Further options in the SLE and SLT trims include 20-inch alloy wheels, upgraded rear-seat DVD entertainment and remote engine start, with the SLT further eligible for a navigation suite boasting a 7-inch display. The Denali, meantime, is eligible for the available rear-seat DVD entertainment system, remote engine start and upgraded 22-inch wheels. Jimmy’s Yukon XL 1500 trim-level in both the SLE and SLT variations can also be equipped with the available integrated trailer brake controller that’s standard in the 2500 pairing. Though reviewers rave about the well-wrought cabins aboard the 2012 Yukon XL, there are still reservations about its unwieldy third-row seat, which all find frustrating to remove and re-install. Said rearmost seat additionally comes in for a share of reviewer disappointment over its less-than-accommodating legroom, with most claiming it fits only small children for any sort of long-haul comfort. A plethora of hard plastics doesn’t sit well with a number of reviewers, while others claim that so-called padded surfaces really are that way in name only. Although the 2012 Yukon XL dwarfs most of its road-born accompanists, it still boasts most traditional (and all government mandated) safety features. All three trims are delivered with standard 4-wheel antilock brakes (ABS) complemented by electronic brakeforce distribution, as well as traction and stability control. Three-row head airbags are also standard across the lineup, as are dual front side-mounted airbags, daytime running lights, dusk-sensing headlights, a post-collision safety system, OnStar emergency services and stolen vehicle recovery assistance, and a remote antitheft alarm. The midlevel SLT 1500 and 2500 trims, as well as the Denali, additionally sport standard front fog/driving lights and a blind-spot warning system, with the Denali adding standard turn-signal-integrated mirrors. The National Highway Traffic Safety Administration (NHTSA) gives the Yukon XL lineup its second-best 4 stars in overall crashworthiness, with it’s third-best 3-star rating in rollover protection dragging down the top-tier 5 stars it awards for front and side impact protection. The Insurance Institute for Highway Safety (IIHS), meanwhile, has no testing data for this big ute. The knee-challenging and difficult-to-remove third-row seats aboard the 2012 Yukon XL lineup are the major bane of most owners. The hefty price tag also leaves a number of XL Denali owners wondering why they didn’t get a Cadillac Escalade, while others could be happier with a more logical instrument and control layout, not to mention a larger nav/audio display screen. Finally, a couple of owners driving the lesser trims complain that, for the money they paid, some better rear-seat comfort and quality had been expected. On the positive side, owners enjoy the ride quality they get with this hefty sport ute, while many revel in what they consider an attractive cabin and a handsome profile. Front seats are described by most owners as comfortable for the long haul, with passenger room and cabin quiet coming in for added kudos. The OnStar technology and Bluetooth hands-free communications, finally, are mentioned by a number of owners as especially convenient and hassle-free. What's your take on the 2012 GMC Yukon XL? 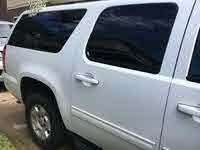 Users ranked 2012 GMC Yukon XL against other cars which they drove/owned. Each ranking was based on 9 categories. Here is the summary of top rankings. 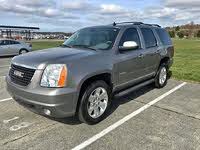 Have you driven a 2012 GMC Yukon XL? I lowered the price and it said it would be listed as a GOOD deal. When I went to the listing the price was lower but it still said fair deal Why? ?